In 1949 the company built and tested the Hiller Powerblade, the world's first hot-cycle pressure-jet rotor. Hot exhaust gases ducted through various Powerblades produced greater efficiency, which was further boosted by the use of "tip burning", a term describing the combustion of fuel at the blade's exhaust nozzle. However, even this arrangement yielded substantially less propulsive efficiency than was obtainable by mounting jet engines right at the rotor blade tips. In 1950, therefore, Hiller abandoned the pressure-jet approach to tip propulsion and dedicated his company to experimentation with tip-mounted engines. Over the next fifteen years, Hiller actively pursued the construction of tip-powered flying cranes with a variety of jet engines at their blade tips. In 1951, the company offered the Army a midsize flying crane called the "Aerial Carryall" or "Flying Truck". It also responded to a Navy request for an aerial-resupply helicopter with the huge "Class HC Heavy Lifter", a collapsible flying crane of tubular construction. Neither of these efforts reached the prototype stage. The Army requested a design study for a flying crane with a 60m rotor in the mid-1950s. Hiller's response was BARC, an acronym for Besson's Aerial Railhead Crane. Named for Major General Frank S. Besson, chief of the Army Transportation Corps, this proposal similarly failed to find support. Neither did a series of parametric studies for a variety of tip-engined flying cranes that Hiller prepared in response to a 1955 military request. By decade's end, it appeared that Hiller's continuing tip-propulsion efforts might at last pay off. Prompted by this promising body of exhaustive research, including thousands of hours of tip-powered rotor testing on Hiller whirlstands, the Army solicited industry bids for a tip-turbine-powered flying crane in the Hiller mold. Clearly favored to win a contract, Hiller teamed with Continental, manufacturer of the J69 turbojet engine. Although the Hiller-Continental team won the initial contract, funding for this Army program was cut in the early 1960s before a prototype was produced. Company hopes for giant tip-powered helicopters revived briefly in 1965 when the National Aeronautics and Space Administration considered sponsoring a Hiller flying crane to recover Saturn V moon booster first stages during Project Apollo. Aerial recovery of this spent first stage, which weighed up to 400 tons, dictated that the Hiller/NASA recovery vehicle be the largest aircraft of any kind yet proposed. The resulting design featured a gross weight of about a 450t and a rotor more than 100m in diameter. Powered by two or more jet engines per blade, this rotor would have turned at 60 rpm, presenting the illusion of slow motion to observers below. 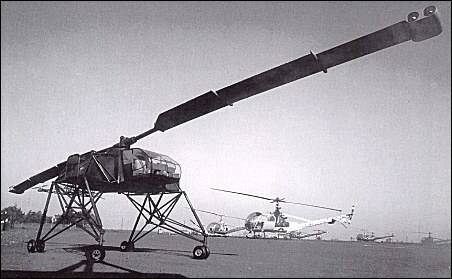 As laid out, the Hiller/NASA flying crane would loiter at 3000m some 750km downrange from Cape Kennedy. Sighting the moon booster descending by parachute, it would use special recovery gear to snag the spent rocket and winch it securely in. If the first pass was unsuccessful, sufficient time would remain for two more attempts before the booster was too near the ocean's surface for another try. Expensive as such a helicopter would have been, the huge aircraft would have paid for itself with the first several recoveries. But long-range planning for the nation's space program was beginning to favor the concept of a reusable space shuttle over single-use rockets, and this recovery helicopter was not funded. Although Hiller never realized the long-held dream of flying crane production for want of government sponsorship, this program did have conspicuous successes. The comprehensive body of research it generated has paved the way for such helicopters to be built in the future, eliminating every real or imagined obstacle to their construction. This program also fostered the development of two generations of the Hiller HJ-1 "Hornet", mentioned above. can i receive more information ,very good,thanks!